With production costs for diesel fuel in the $1.50-$1.75 per gallon range, EBITDA proformas on identified projects suggest an unlevered IRR of 11% for a 20 year project life, using conservative assumptions for market values and capital & operating costs. 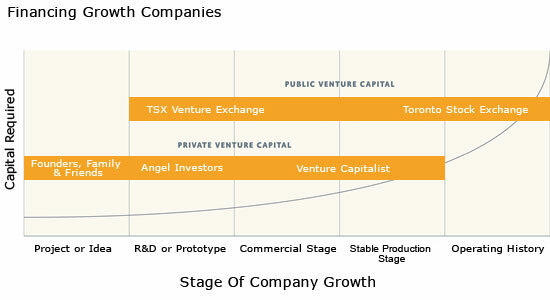 A comparison of Private vs Public capital for the development and growth capital curves. Note: Early stages of project are usually covered by “Friends and Family” and follow-on funding by “angel investors” vs the private venture capital. Recent trends are indicating that private venture capital groups are funding later state projects that are showing revenue and are looking for growth capital.